Number of Bolts to be Placed: P1: 8 bolts + 2-bolt anchor; P2: 17 bolts + 2-bolt anchor. Proposed Grade: P1: 5.9; P2: 5.13? Route Description:The proposed route is a completely independent, 65-meter line that will logically be split into two pitches. The first pitch climbs a solid, low-angled slab for about 20 meters to a slanting ledge at the lowest point of where the wall kicks back to vertical and then overhanging. It’s about 5.9 to the ledge. Pitch two will takes a fantastic, direct line up the steepest part of the wall to the right of the left-facing corner of Archaeopteryx, finishing with a wild, overhanging arête. This pitch is about 45 meters long and it finishes on top of Seal Rock. The Hinge (aka Side Door): a two-pitch line awaiting a redpoint from Phil Gruber and partner. It is supposed to be 13a or 13b. 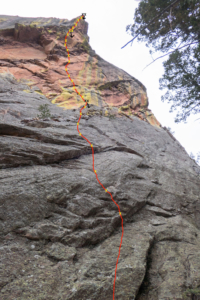 This route shares the first pitch of Yellow Door, then busts straight up the vertical face to anchors at the lip. Yellow Door (original version): a 2 pitch climb, with the first pitch rated 12c and the second pitch rated 13a. 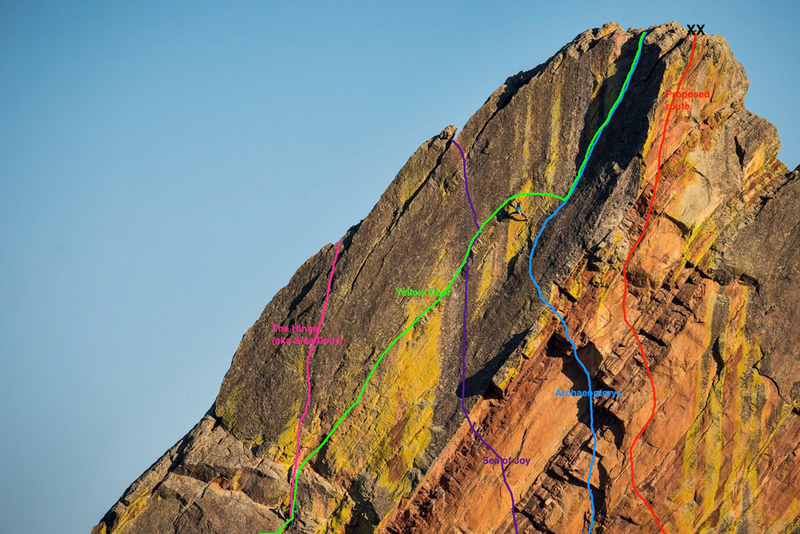 The route is mostly bolted, but takes gear at the start of the first pitch and end of the second pitch. [The recommended way of climbing Yellow Door (by Gruber) is to finish on Sea of Joy, which makes the second pitch 13b)]. 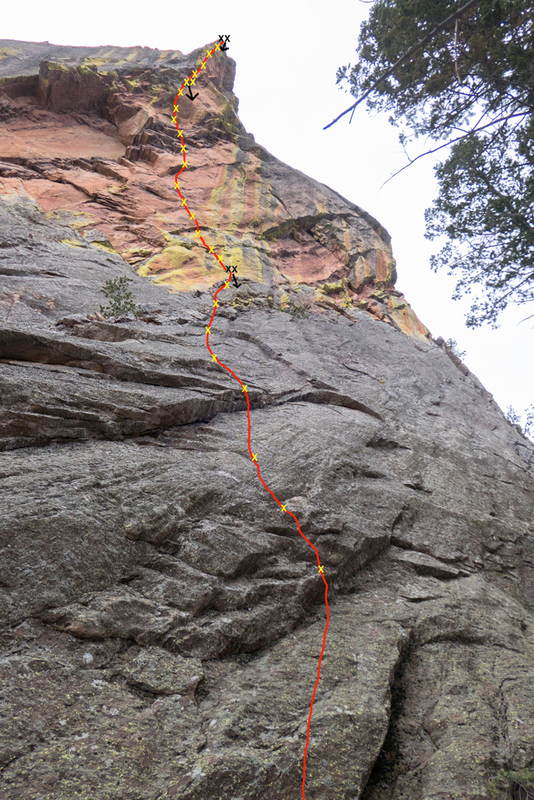 Sea of Joy: a two-pitch route that starts about 100’ right of Yellow Door. It is rated 13a and is mostly bolted, but takes some gear on the first pitch. Archaeopteryx: This 5.11+ trad route starts about 20 feet right of Yellow Door, and about 80 feet left of my proposed route. This is the closest of any existing routes to my proposal. 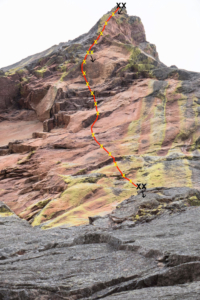 At one point, on the second pitch of the proposed route, the two routes are about 20 feet apart — the closest they get to each other. That said, there is no logical way a climber could get from one to the other, as Archaeopteryx follows a left-facing corner and this route stays right of a blunt arête to the right of the Archaeopteryx corner. 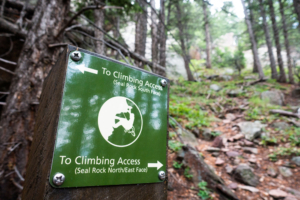 A description of the approach (include approximate distance from the designated trail system, existing “social” or undesignated trails leading to the climb and condition of the trail, and state whether there is a durable surface, such as rock. Include photographs of the approach. ): The approach is up the designated trail to the base of Seal Rock, and then up the climbers trail to the North side of Seal Rock. This is the same trail used to access all the existing climbs on the North face of Seal Rock, just walk about 80 feet further uphill than for Archaeopteryx. This is also the descent route for all routes on the East face of Seal Rock. 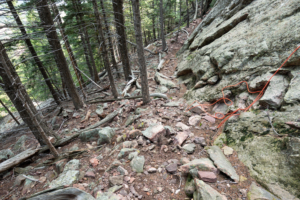 If different from the approach, a description of the descent, (include approximate distance from the designated trail system, existing “social” or undesignated trails, a description of the trail condition and whether there is a durable surface, such as rock. Include photographs of the descent. 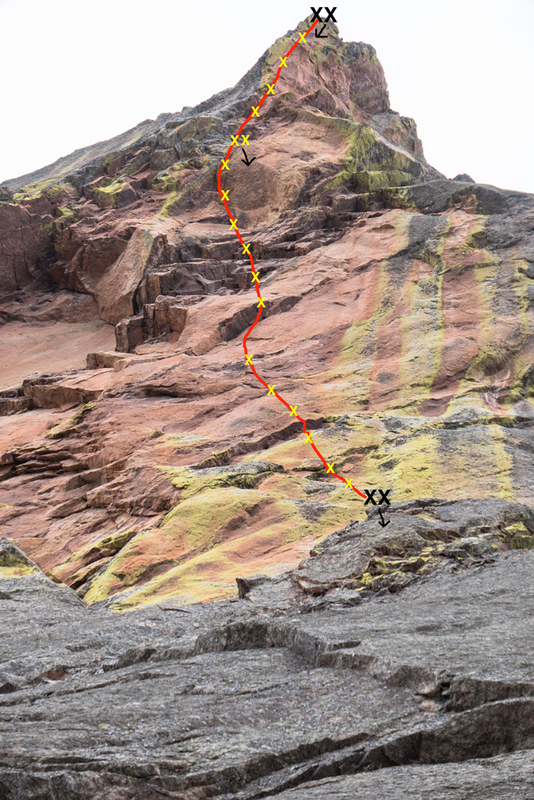 ): The descent from this route (with a standard 60-meter or 70-meter rope) requires lowering from the top anchor to an intermediate lowering anchor situated approximately 15 meters from the top, at the 13th bolt of the second pitch (as marked in photos). The climber will clip in here, pull the lead line and re-thread through this anchor for one more lower to the anchor above the first pitch. One rappel from here reaches the ground. A description of the area at the base of the climb (include existing levels of soil compaction, existence of a durable surface such as rock, and existing soil erosion. 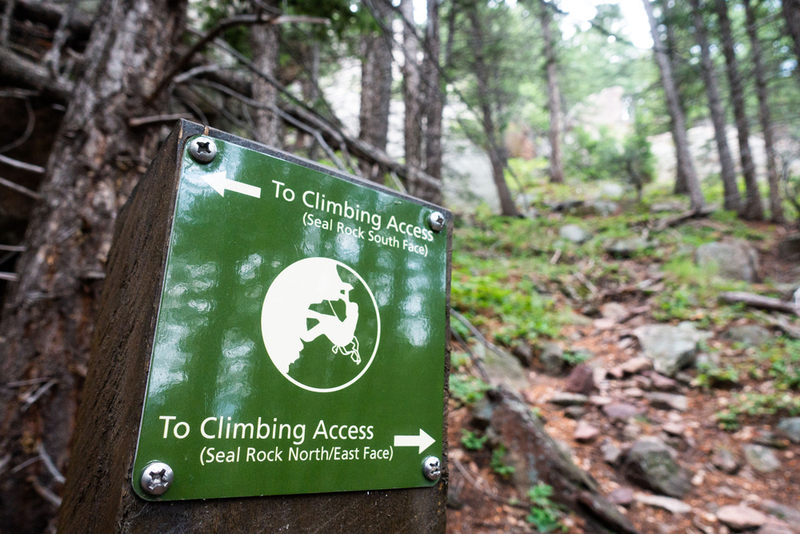 Include photographs of the area at the base of the climb. 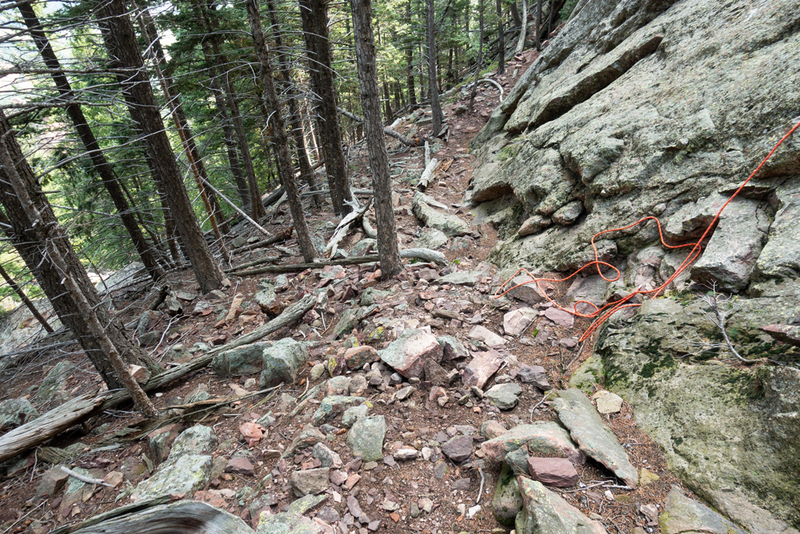 ): The base of the climb is a mix of rock and compact dirt. Thoughtful parties will flake their rope on or adjacent to the low-angled rock at the base of the north face. Has all reconnaissance work that can be reasonably done, short of placing any hardware, been done? Yes. First, I thoroughly inspected the route (and entire face) from the ground with binoculars. Then, on a different day, I rappelled the route with as many directionals as I could find. I identified the exact line, confirmed its quality and independence, and toproped the entire first pitch, plus the first 15 meters and last 10 meters of the second pitch. I got a very close look — hanging a few meters out from the wall — at the middle 20 meters of the second pitch, which I could not possibly toprope due to a lack of directionals. Has the route been top roped? Is there loose rock? Is it extremely overhanging? Yes, the route has been toproped as much as possible (see previous comments). There is some loose rock in the form of some hanging flakes, but the base rock is of excellent quality. Yes, the second pitch overhangs roughly 10 meters. Additional notes: I haven’t been this excited about a new route near Boulder in quite a while. The second pitch promises to be stellar. And an entirely independent line!!! I believe it should be approved. This looks amazing. Do it up! This seems like a truly awesome line: direct and logical line straight to the summit. It will surely make for an amazing route! Wag-Bag Pillow Fight Successful year for cliff-nesting raptors!